James Monroe Museum Political Cartoons | May I Peep Through This Knothole? Looks like Herbert Hoover is trying to get a one up on the Republicans! 1936 was an election year and Republican candidate, Alfred Landon, was doing his best to attack the New Deal plans that Democratic nominee, Franklin D. Roosevelt, was putting into play as president. Herbert Hoover was still popular with the democrats at this time and was doing all that he could to help his political party win the presidency, even if it meant spying on the Republicans. Kansas Historical Society, Kansapedia, http://www.kshs.org/kansapedia/alfred-m-landon/12126 (accessed April 21, 2012). C.K. 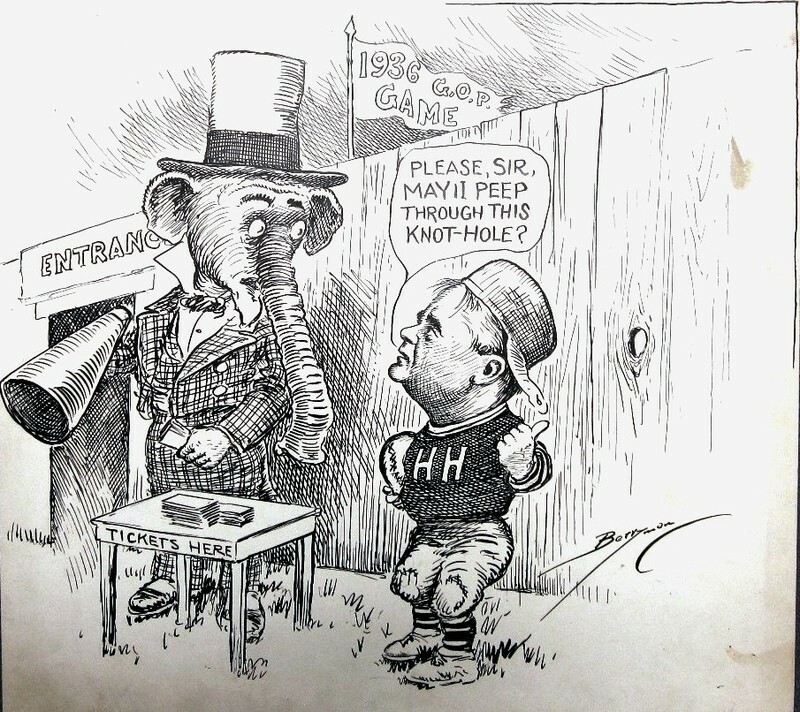 Berryman, “May I Peep Through This Knothole?,” James Monroe Museum Political Cartoons, accessed April 19, 2019, http://jmpolitoons.umwhistory.org/items/show/114.